will be confirmed and secrets revealed as the forces of light and darkness collide in a desperate struggle to control the keys to the demon prison. W-O-W! What a series finale! There is more action in the first 100 pages than in the entire series to date. It is fast paced and adventure looms at every page! All the mythical creatures we've met thus far all come together in this last book for an adventure to rival the best! We also meet a new character, Bracken. He is MY FAVORITE, and I wish he would have been here from the start. Better late than never. I craved more of him though, and was secretly waiting for a romance to brew between him and Kendra. It is a big book full of action and adventure. I am sad to see the series end, but so glad that Brandon Mull will have a new series out next year for us to enjoy. If you haven't picked this series up, you are sure missing out. It is a cross between Harry Potter and The Chronicles of Narnia! What's not to like?! 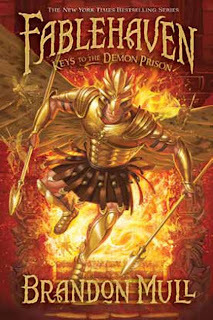 You won't regret it, Fablehaven is my favorite fantasy series! "For endless televison!" Newell cried charging into battle. "For Frito-Lay!" Doren yelled, waving his knife overhead. OMG OMG OMG - I GOTTA read this, Aubrey and I have read each book in the series up till now, together - and have this one waiting in the wings! WE MUST MAKE TIME! Thanks for this, you pushed me over the edge to NEEDING to know what happens! Wow, action and adventure to the max! I'm not a usual fantasy reader, but who doesn't love an exciting book once in a while? Great review! My grandson's listened to book 1 on CD and it was great. Wish I could get all the books on CD. They are too expensive for me to buy and the local libraries only have Books 1 & 4 on CD. One grandson has read to book three. The other is dyslexic and is struggling. Oh, Fablehaven. I loved and hated this book all at once. You're right, it was so action packed...but I almost felt that it was too full of adventure--like Mull was cramming a million things together to finish the series. I think it could have and should have been two books. Maybe I'm just annoyed with myself for obsessing over it so much and wish he could have had some 'down time' in there for me to catch my breath (or at least get some house work done)! Regardless, it was excellent. My husband started reading it one evening and didn't go to bed til he was done (sometime around 5am). I felt the same way and highly recommend it.